3 weeks after the marathon and I’m feeling a bit lost. The marathon is such an absorbing target and there are so many small steps to take in getting to it that you switch off from long-term planning for the duration of the training program – at least I do. I’ve sort of taken it easy since then, running on and off with little direction or aim. Which is quite nice after so many months of feeling I had to run a certain distance or pace each day, but nonetheless I’m finding that without a plan I’m not doing enough running.. Not enough running to keep the pounds off, my fitness together or my head straight.. So – enough of this. Starting today I’m going back on 45 mins a day, at least 5 days a week. Once a week there’ll be Lincoln and District Runners and I’ll commit myself to a race with them tomorrow – either relay cross country (which sounds like fun) or something short like a 5 miler somewhere. Speedwork has definitely got to be on the menu now – I think that incorporating it into my weekly running should make a real difference to my speed in longer races. In other news I sent a picture of my wall of glory (see right) to Catch me if you Can and Terry, the blog owner and host has promised to put it up sometime soon. 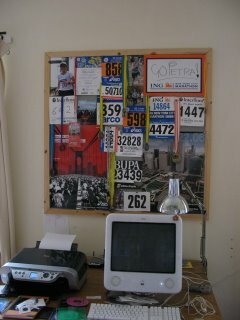 My wall of glory has all my race numbers and medals on it. It’s in my study – in theory my room of the house – so I can sit there quietly admiring myself without irritating the rest of my family. Anyway .. so now I stop writing and start running. After my coffee..
Coda I did it! Hard to believe something like running for 45 minutes could pose as much of a challenge as it did but somehow that was the case.. It’s not physically hard, just mentally hard to not stop after 3o minutes. I’ve been telling myself I needed a break after the marathon – which I did – but I think 3 weeks off is about enough. Back in the saddle now.. Nothing like making a public promise to myself to make me stick to it. Thought I would let you know that your picture is up on Catch Me If You Can. Thank you so much for the submission and the links on your blog! Happy running.